Wednesday night punk rock’s biggest overachiever Henry Rollins hosted a benefit concert for Drop In The Bucket, his current favorite charity, and a bunch of his friends dropped in to say hello. And by ‘say hello,’ I mean take the stage and shred, and by ‘friends’ I mean music legends like Corey Taylor of Slipknot, Scott Ian of Anthrax, Dave Lombardo of Slayer, and Dave Navarro of Jane’s Addiction. 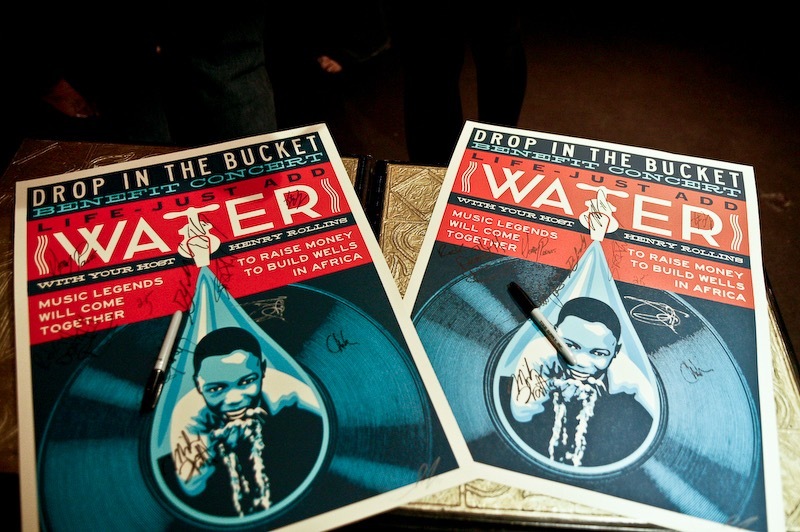 The event was held at the historic Avalon Ballroom in Los Angeles and all proceeds went to benefit the NGO founded by John and Stacey Travis to help bring clean water to schools in the war torn region of Africa between Southern Sudan and Northern Uganda. The night rounded out with all of Rollins and all his pals taking the stage for an epic set of covers including “Everlong” by the Foo Fighters and “Crazy Train” by Black Sabbath. Watching all these heavyweights gathered to play their hearts out for this cause, beneath a slideshow of the faces of beaming African children all personally touched by the work of Drop In The Bucket, one can’t help but feel momentarily part of something much bigger than oneself. Or in Rollins’ words “That’s what the test of this century is going to be. People giving outside of their own area of concern and responsibility, or at least acknowledging their area of concern and responsibility to be larger than their dinner plate, their county, or their state, or their own country’s borders.” Last night 1,500 of us, in a small but meaningful way, did just that.